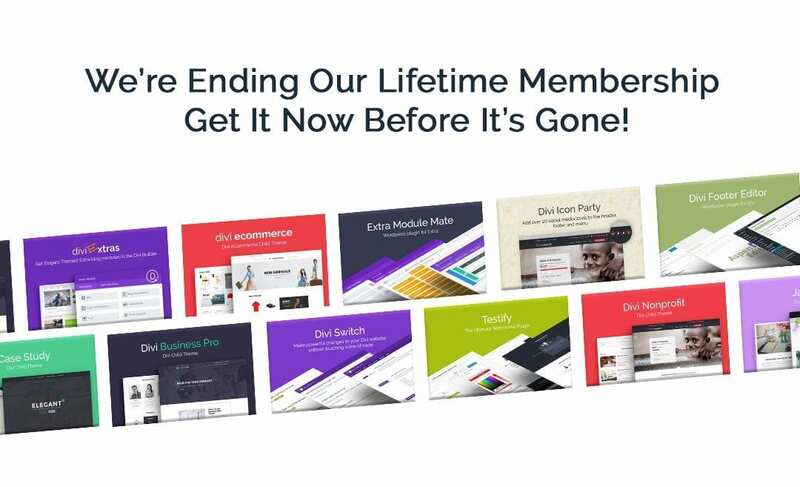 Since we launched our Lifetime Membership last year, we’ve added over 20 new amazing products / child themes plugins both free and premium, and seen amazing growth. To reflect the value our members have received from this membership and to make room for us to focus on other amazing products coming your way, we’ll be removing our Lifetime Membership plan on September 1, 2018. Existing Lifetime Membership members will not be affected, you will be grandfathered in. If you’ve already purchased a Lifetime Membership, you’re locked in for life. For everyone else… This month is your last chance to get a lifetime license for a one-time fee. This will grandfather you for lifetime updates and support for current Lifetime Membership products and all future products added to this membership. Click here to invest in lifetime updates and support while it lasts. …and we have a LOT more exciting things planned for you. A Premium Divi Child Theme designed for Photographers with built in integrations like an LMS, ECommerce platform, a client booking system, custom portfolio galleries and event listings and scheduling. A versatile LMS Sync plugin that will allow you to connect a LMS plugin, such as LifterLMS, and an e-commerce plugin, such as WooCommerce or Easy Digital Downloads. Well developed plugins and other assets that are practical and extremely useful. When developing a website, Aspen Grove Studios’ products certainly help take a load of frustration off my back. Not only that, their support for these products is second to none! I have purchase many items from Aspen Grove and been very happy with them. I purchased the lifetime membership since they have consistently had great items. I recently had a CSS issue and they promptly assisted me in fixing my site. I have had to contact them a total of 2 times and have been very happy with their support and excellent customer service. I just bought AGS’ plugin “EXTRA Module Mate” for enhancing my theme with all the neat functions the original theme offers. The plugin does an excellent job! And the price is a snap (!) considering what one gets injected in the templates. It is awesome. For a one-time fee, you’ll join the ranks of over 20,000 happy customers receiving this huge value! Get Lifetime access to existing products, plus Lifetime access for all new products added to this membership. But you have to hurry, time is running out to join! Click here to get your Lifetime License while you can. To lock in your access to ALL Lifetime Membership products for life, plus lifetime support, click here to get the Lifetime Membership before September 1st. As always, thank you for your support of Aspen Grove Studios. Your feedback, comments, shares, and messages are critical to help us make our memberships the best WordPress and Divi product company. Be sure to keep in touch, since we have a ton of new products planned for you. To be the first to know about all of our amazing updates and future releases, subscribe to our email newsletter and follow us on Twitter and Facebook. BUY NOW BEFORE IT'S GONE! Next post Introducing The 42 Theme for Gutenberg from Aspen Grove Studios! I just bought mine in the last month. How did I know? Hey? Can I buy more and resell them to other people later? Seriously, this is one of the best decisions I’ve made, along with lifetime ET! Thanks Randy! We have some pretty exciting things coming out to end 2018 with a bang! I’ve bought lifetime membership for Divi Space at $297 is this one and the same as you guys are all amalgamated? Do lifetime members receive any discounts for courses, such as the CSS/JQuery course? If we are on an annual plan may we upgrade to lifetime for the $$$ difference? I noted in your reply to Mickey Diener that the CSS/JQuet course is included in the Lifetime Membership. Please can you explain how to access this. Currently when I go to my Account/Membership, it only gives me the option to purchase. Hi Rocky, send an email to support@aspengrovestudios.com and we will get a custom coupon to purchase the course. It’s not auto-added to the membership unfortunately. The wording above states “lifetime updates and support for current Lifetime Membership products and all future products added to this membership” Does this mean that you are planning to release other products not covered by a lifetime membership? Hi James, we will definitely be releasing new products into our current membership. For example in the next month we have a new Divi Photography Child Theme and a Divi Icon Expansion Pack Pro version that will be added as well. are those courses are the part of membership? Hi Syed, the CSS & jQuery course is covered by the membership and Lifetime members receive 25% courses such as the Divi Business course.